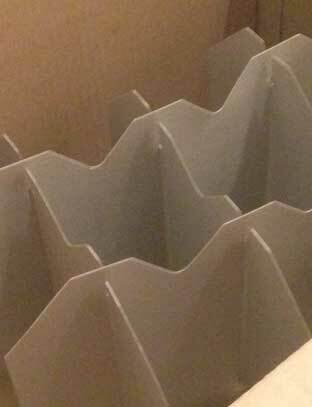 When selecting a box to ship your wine you need to consider the thickness of the outer shell, the thickness of the separators and if you will be shipping your wine standing upright or lying flat. The following advice applies to standard size 750ml bottles of wine. Larger formats and wine in presentation cases may require a different approach. Older wine where you have no storage history or any ports should always be shipped upright. Also if you have riesling or other wine that is in tall bottles then you will find that the majority of flat pack boxes will not be suitable. If you have a collection of premium, good quality wine and you are certain of the purchase and storage history (provenance) and if you know it has been lying flat, undisturbed then you can confidently ship it laying flat. However, wine that has not been stored in cellar like conditions or in temperature control should be shipped standing upright as poorly stored bottles are more likely to leak if shipped lying flat. The best sort of wine boxes are made from sturdy cardboard, either flat packs or uprights and they should be made specifically for wine bottles. Trying to use vegetable, toaster or other boxes not intended to protect and support the weight of a full bottle of wine can often have undesirable outcomes. 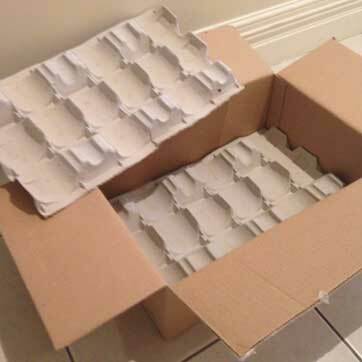 Polystyrene foam packers are OK for a small shipment of wine or for shipping overseas but are too bulky for moving a medium to large collection and the polystyrene itself is a very expensive option. The best inserts are separators of double thickness (for upright boxes) or the specially made cardboard inserts for flat packs. The most important thing is that the separator reaches at least to the height of the bottle and does not allow the bottles to make contact if the box were to receive a sudden change of direction. Never use loose foam beading (the small micro beads) or bio-degradable packing peanuts (made from cornstarch), if condensation occurs they can breakdown, voiding the protection they confer and it can get messy, potentially staining your labels. Loosely scrunched newspaper is ok to keep the top of the bottle from rattling around but should never be used to wrap the bottle, especially around the label. Warning: DONOT ship your wine during periods of sustained hot weather. Will usually throw them out on a regular basis after a delivery day. Either call them before hand or drop in and see if they have any spare. Will have the single and double packaging in most of their local post offices and a larger variety in the business centres. 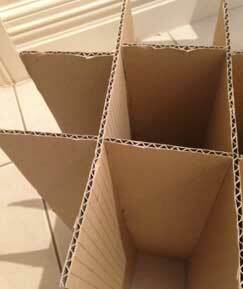 Major wine storage specialists such as National Storage will usually stock good quality flat packs. For the full service (pack, move and store temporarily if needed) when moving your wine collection there are only a few very specialist companies in Australia such as Cellarmove in Melbourne who use special climate controlled vans for transport. Sometimes you just need to clear out some of your excess wine to make room for new tastes or if you are moving house it can sometimes be too expensive or impractical to include your wine collection. 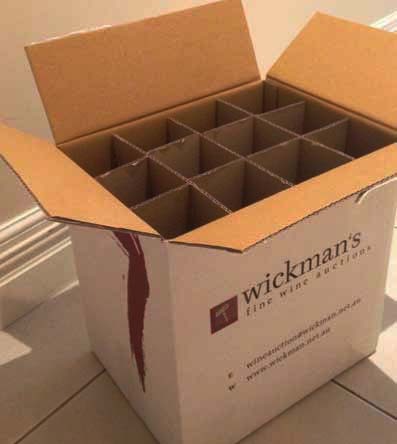 Specialist wine auction houses such as Wickmans can provide the full service to clear out your cellar including a free auction valuation, boxes, tape guns and packing tape, wine transport and insurance.